The impending denouement of the (Democratic) primary shows all the worst aspects that derive from identity politics. Hillary supporters who don’t have any policy disputes to speak of with Obama are furious because he’s not a woman. Many of his supporters are furious at the thought that he should have the nomination taken away from him because he’s an African American. These are the wrong reasons to be for or against candidates. You should be for them because you admire them or you agree with their principles. You can also negotiate policy disputes, you can’t negotiate identity disputes. This is the wrong way to go about democracy. True indeed, as far as it goes. But he is being too kind. The core problem is that identity politics has been used as a proxy for power politics, not for itself – which would of course be bad enough. It’s not so much that Obama is a black, but that he is in the way and therefore a certain rhetorical tilt has been added to the discourse that seeks to use his colour as a means of undermining his candidacy by pointing at his electability. That he had remarkably high levels earlier in the campaign demonstrates that at the very least the process of attrition caused by the relentless conflict has not been without results. And what is astounding is the almost implacable insularity of a Clinton campaign which has appeared almost oblivious, or worse indifferent, as regards the damage this conflict has done to their previously quite good reputation (all things considered). I don’t think that the Clintons harbour any of the negative viewpoints they tangentially summon up. Not for one minute. And any ire they hold for Obama is that of any original front-runner overtaken by another contender. It’s just politics. Nothing personal. Posted by WorldbyStorm in Books, Culture. Some of you may recall from the late 1980s a series of books issued by Pluto Press under the Pluto Crime imprint. Chapters Bookshop in Dublin, then just off Henry Street, had a box load of them and sometime around 1989 I bought about eight of them at a discounted price. The imprint had a cute logo with the PP of Pluto Press rendered as a bloody red fingerprint. Clever. Characterised for the most part by unrelenting gloom the books were fairly throwaway. But not entirely. There were three or four which I thought were able to operate as thrillers and left-wing books. I don’t find that entirely unsurprising. 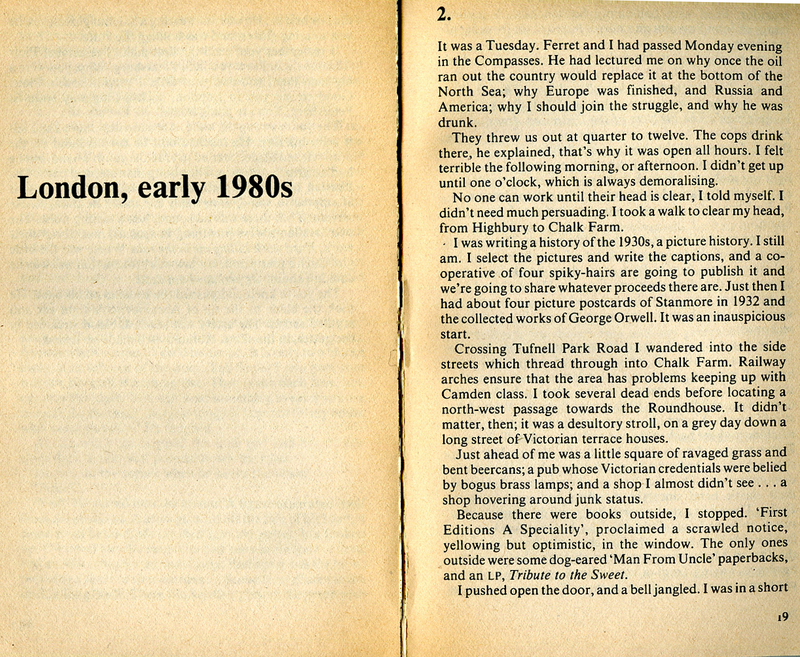 Previously the issue of dissidence against the establishment in the Len Deighton thrillers has been discussed. But this was different insofar as they were explicitly left wing. Now this ranged from a sort of cynical approach to international affairs to Manuel Vazquez Montalban’s novel “Murder in the Central Committee”. Central Committee of the… well if you haven’t guessed the party, let’s just say it has Communist and Spanish in its name. October Heat by Gordon DeMarco dealt with a hard-boiled leftwing PI in San Francisco in the 1940s (unions, Red Scares, and suchlike were the backdrop) while Junk on the Hill by Jeremy Pikser took a fairly cynical look at therapy and ‘new age’ tropes in the US. Unsurprisingly, to me at least, Julian Rathbone, a very fine writer with a decidedly left wing approach contributed two books to the series, The Euro-Killers and Watching the Detectives. Both were quite excellent (and those who followed his career both before and after may know that he has subsequently written some brilliantly sardonic novels rooted in English history). So, did it work? Well, not entirely. 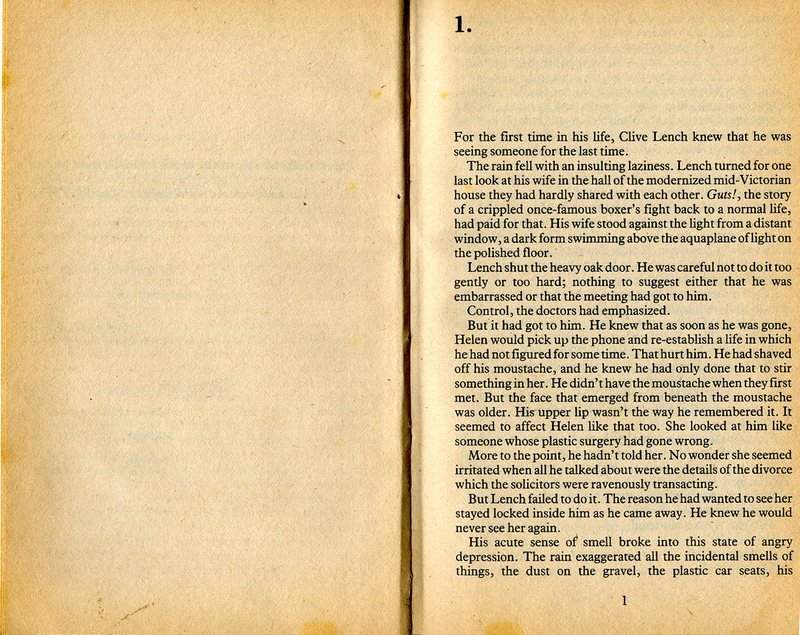 Many of the books were a bit slight, perhaps rushed from first or second draft to publication. Some were trying too hard to be left-wing. Nor did the blurbs help. For example, the Anvil Agreement dealt with big pharma, and was described as ‘…a medical thriller of Coma standards…’ (Coma being a popular medical thriller and later film…). Well. Coma standards, you say? That low? Alright then. 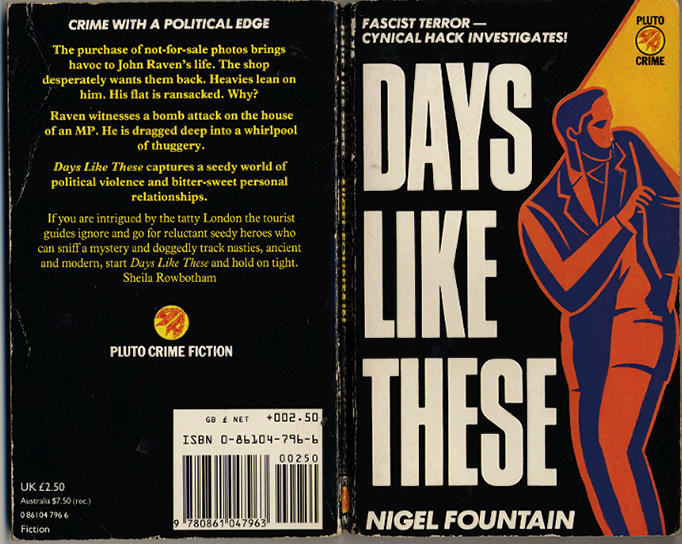 For my money, while no classic, the best was arguably Days Like These by Nigel Fountain, as far as I can make out an SWP member. It had a party member coming across a fascist conspiracy, of sorts. Somehow it did convincingly convey something of the tone of London in the late 1980s and the nature of the politics too. Drug taking, gloomy sexual politics, an old Communist of the CPGB persuasion who was written about in a much more admiring way than one might imagine, and the Establishment and the real Establishment all made appearances. And enjoyably murky and cynical it all was. That said, I can imagine many publishers resiling from the idea that they would promote ‘left’ or indeed ‘right’ books, simply because that might limit their readership. And, of course, while it is always nice to find a book which perhaps shares aspects of ones world view, there are many authors whose beliefs are quite different and distinct who nonetheless establish themselves as favourites. And in part that was perhaps a crucial problem with the idea. Crime and political thrillers have often tended to work from the basis of opposition, whether to the establishment, social structures or even states, they tend to pitch an individual against a system. I can, and I’m sure you as well, list off scores of leftish political thrillers from that time and afterwards. They work, or fail, not because of their political stance, but in large part because of the sense of the individual against greater forces, be they wealth, corrupt police forces or whatever. Now, that of course is a political stance, but somehow to rope the collective, or aspects of collective action into such works is more difficult. I’d love to know how the series fared, how long it lasted and did the books sell? Anyone know? No. No, wait, sorry, that’s all nonsense. Because, twice this week it is necessary to comment on the vacuity of the Blairite project. [the business secretary, John] Hutton provoked the ire of trade unions earlier today as challenged the “automatic assumption” that further legislation was the only way to deal with exploitation in the workplace. It sounds so easy, doesn’t it? That the workplace is in some sense an arena in which equals engage rather than top down hierarchies. That it is possible to easily ‘work out what is best for their own circumstances’. Incidentally, considering the incredible Phil Collins statements about the Fabians, one can only wonder at the irony of the venue. “Unity is an absolute precondition for progress and the prospect to serve our country for a fourth term in office,” Hutton said. “Having a multiplicity of employment rights does not amount to a great deal if you can’t get a job in the first place,” said Hutton. Hutton said the Labour government had reached “the end of the era” on considering major new regulations as the best way to improve standards. Employment rights should both support market competition and ensure people have the right to work, echoing Labour’s twin themes of supporting wealth creation and promoting fairness, he added. Once the employer and the employee have discussed the request, the employer must notify the employee of the decision in writing. What is a business ground? An application can be refused only where there is a clear business reason. The business ground(s) for refusing an application must be from one of those listed below. Wouldn’t almost any such request fall afoul of ‘Burden of additional costs’? How should the refusal be explained? In addition to providing a specific business ground the employer must include an explanation about why the business ground applies in the circumstances. Experience shows that an employee who understands why a business reason is relevant will accept the outcome and be satisfied that their application has been considered seriously, even if they are disappointed that their application has been refused. It also shows that the reverse is true, particularly if the explanation is not sufficient for understanding. The explanation should include the key facts about why the business ground applies. These should be accurate and clearly relevant to the business ground. To prevent any uncertainty, the explanation should avoid the use of unfamiliar jargon and should be written in plain English. An explanation of around two paragraphs will usually be sufficient, although the actual length of explanation necessary to demonstrate why the business ground applies will differ depending on each individual case. As I indicated when we met to discuss the application, if you decide to change the day you would prefer not to work to one earlier in the week, then I would be happy to reconsider your application’. Any facts quoted in the explanation must be accurate. It is not a necessity for the employer to provide the detail in the explanation, but they should ensure that they are able to back up any facts should they subsequently be disputed. A decision based on incorrect facts to reject an application would provide an employee with a basis to make a complaint to an employment tribunal. It’s almost surreal. One can easily imagine the conversations in businesses that ensue. Not that the reality would be anything other than an employee knowing full well what sort of response might be forthcoming. One tends to pick up on that sort of thing… It really has to be one of the most dismal and cosmetic forays into the labour relations area ever. And this from a ‘Labour’ government? Given that so much more is needed, it may seem overly optimistic to see the rather weak right to request flexible working as a first step in a movement towards gender equality based on the universal care-giver/worker model. ‘Rather weak right’, well, that’s a kind way of putting it. And what is most annoying is the way in which it typifies more Labour doublespeak on such matters because as ever they are attempting to talk one way and, very slightly, tilt another. His comments come just weeks after the government agreed to change the law to ensure agency workers’ rights kick in after three months, instead of a year – following intensive lobbying from trade unions. Hutton promised new measures to protect vulnerable workers, pledging to remove legal barriers that hamper action against rogue employers. “This Labour government will always focus on those most in need,” he said. So, some limited improvements in some areas. Some clear stasis in others, and yet again Labour is unwilling to actually sell a left project for fear of upsetting the middle classes. End of an era he says? Too right. Posted by WorldbyStorm in US Media, US Politics. Sort of entertaining, isn’t it (if one is willing to put aside the awful grinding reality of the events to which he refers and their very human impacts) to read Scott McClellan opine upon the Bush White House and its ways. “…confused the propaganda campaign with the high level of candour and honesty so fundamentally needed to build and then sustain public support during a time of war”. “… I fell far short of living up to the kind of public servant I wanted to be”. Regime change. Does it get better than this? Posted by WorldbyStorm in Irish Politics, Northern Ireland. 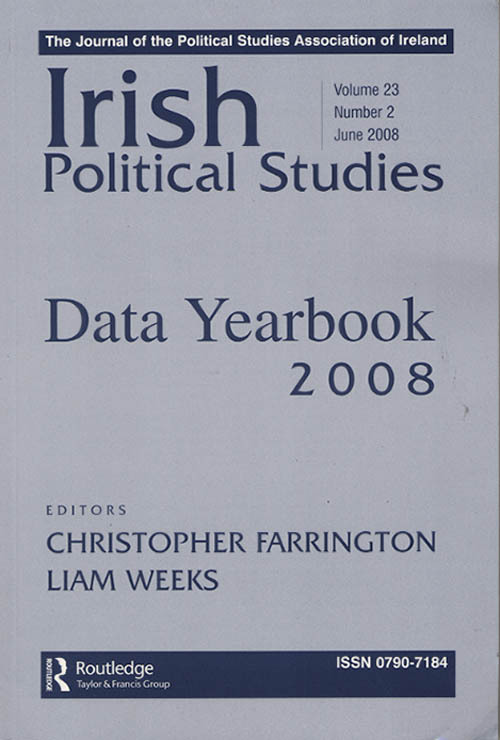 It’s that time of year again when the Political Studies Association of Ireland Data Yearbook drops through the letterbox. And as ever it’s… well, perhaps not a great read, but certainly a read. 36%, 23% and 40% respectively… and 1% don’t know. Unfortunately the breakdown is by religion rather than political identity, so only 3% of Catholics consider themselves Unionist, while no Protestants in this sample considered themselves Nationalist. Those of either tradition who were Neither amounted to 42% of Catholics and 30% of Protestants. And those with No Religion amounted to 73% considering themselves Neither. Does that sound plausible? Perhaps. What of the answers to the question ‘Do you think the long-term policy for Northern Ireland should be for it to remain part of the UK?’… 54%… ‘reunify with the rest of Ireland?’…30%… ‘become and Independent state’… 3%, Other… 1%… Don’t Know… 12%. Apparently 22% of Catholics considered it should remain part of the UK while 7% of Protestants thought it should reunite. ‘Almost impossible to accept…’ 10%, ‘Would not like it but would live with it…’ 43%, ‘Would happily accept the wishes of the majority…’ 42%, ‘Don’t know’ 6%. Of those 1% of Catholics found it almost impossible to accept, and 21% said they would not like it but would live with it. ‘Almost impossible to accept…’ 3%, ‘Would not like it but would live with it…’ 27%, ‘Would happily accept the wishes of the majority…’ 60%, ‘Don’t know’ 10%. Of them 4% of Catholics and 1% of Protestants ‘would find it impossible to accept’. I’m always fascinated by those 1% on either side of that equation coming from the other national identity. Is that a joke response or some utterly marginal opinion? Overall when asked how they voted in 1998 on the Good Friday Agreement, 40% voted Yes, 13% voted No, 18% didn’t vote, 15% not registered to vote, 13% didn’t know or can’t remember. Of Catholics asked 50% voted Yes, 3% voted No, 15% didn’t vote, 19% weren’t registered to vote and 12% didn’t know or couldn’t remember. Of Protestants asked 34% voted Yes, 25% voted No, 18% didn’t vote, 9% weren’t registered while 14% don’t know or can’t remember. Which is interesting when we look at the actual figures for the GFA/BA which had an overall Yes vote of 71% and a No vote of 28.9% (on a turnout of about 80%). Various estimates have been made as to the breakdown of those votes, but generally it is thought that somewhere around 90% plus of Catholics and 55% plus of Protestants voted Yes. Clearly memory is a fickle thing. And support for the present dispensation…. ‘given a vote on the St. Andrews Agreement‘ (and this was last year when the poll was taken)…vote Yes… 45%, vote No… 8%, wouldn’t vote… 16%, not registered to vote 3%, Don’t Know… 28%. I wonder what it would be today? NI should become a separate independent state from the UK and EU: 2% total, 6% of Catholics and 3% of Protestants. NI should become independent and separate from the UK but remain part of the EU: 4% total, 6% Catholic, 3% Protestant. NI should remain part of the UK with it’s own parliament which has law-making and taxation powers: 42% total, 8% Catholic, 22% Protestant. NI should remain part of the UK with its own elected assembly which has limited law making powers only: 16% total, 8% Catholic, 22% Protestant. NI should remain part of the UK without an elected assembly: 5% total, 3% Catholic, 7% Protestant. NI should unify with the Republic of Ireland: 23% total, 48% Catholic, 2% Protestant. Don’t Know 9% total, 13% Catholic, 5% Protestant. So, we can pick away at these to our hearts content. Everyone can find something to give them solace. Still, a number of thoughts come to mind. No wonder political unionism has been so oddly weak over the past decade or so in the face of such division on what the shape of the future should be. And these divisions remain. Simply put there is no agreed position and the dominance of the DUP at the present time may well simply be a facade, or a product of the electoral processes that have led us to this point, a sort of ‘least worst’ option as it were. And while the largest bloc of coherent communal support is for a UI (albeit considering the number of Catholics is lower in the poll than Protestants) and that implies that a party able to monopolise that on the nationalist/Republican side will have a secure base, it doesn’t preclude alternative nationalist or Republican parties making headway around other stances and positions. UUP – 14%, SDLP – 13%, DUP – 18%, APNI – 6%, SF – 11%, PUP – 0%, NIWC – 1%, Other – 2%, None – 21%, Don’t Know – 13%. Oddities in the data? The 1% of Catholics supporting the DUP – and another 1% supporting the UUP, whereas 0% of Protestants supported SF. The 22% of Catholics supporting none (along with 15% of Don’t Knows), while 17% of Protestants supported none and 11% plumped for Don’t Knows. Again, this might indicate short-term political memory loss, or more likely hidden within the Don’t Know’s and Nones a significant tranche of support for SF and the DUP. UUP – 14.9%, SDLP – 15.2%, DUP – 30.1%, APNI – 5.2%, SF – 26.2%, PUP – 0.6%, NIWC – N/A%, Green Party – 1.7%. There was clearly an epidemic of indecision up North in 2006/7… or someone was being very coy to the pollsters. And it seems clear which it was. This then throws up an anomaly. How much can we trust this data? If such significant active information as regards voting intentions is concealed then can we set any store at all in the answers to the questions on broader political/national identity? Even with the obvious health warning that a poll, any poll, is a snapshot it seems to me that the data here is open to considerable question. The only means of determining genuine, as distinct from aspirational or even deliberately inaccurate findings, would probably be an election. But who wants that? Posted by WorldbyStorm in Campaigns, International Politics. Final negotiations are underway right now in Dublin, Ireland on a treaty to ban cluster bombs. Arms manufacturers are pushing governments to riddle the treaty with loopholes and delays — and the final text will be decided in the next 72 hours. Cluster munitions don’t just kill during war. They scatter small, shiny, unexploded “bomblets” on the ground that hold their deadly charge for years. When children pick them up, they are often maimed or killed. Most governments agree that these weapons should be outlawed, but back-room pressure is rising to undercut a strong ban. Cluster bombs are one of the most dangerous weapons of today. The majority of their victims are civilians, affecting millions worldwide. They have absolutely no place in a conflict situation. This week governments have gathered together in Dublin to outlaw this dangerous weapon. This is a historic meeting of the international community. Some governments are trying to undermine and weaken the treaty with loopholes and exceptions. They are trying to position the arms trade over the importance of lives of people like me. Rich governments don’t always listen to victims, but they will listen to you — their citizens. Please send a strong message to your government now that calls for a treaty with no exception, no loopholes, and no delays. In 1997, the people-powered International Campaign to Ban Land Mines won a victory for humanity, earning a Nobel Peace Prize by ending the barbaric practice of laying mines in conflict zones. It would not have been possible without the efforts of thousands of ordinary people. This week, we can take the next step towards a more just, more peaceful world — a world safer for children, and for generations to come. Got to agree with a letter in the Irish Times today from a correspondent writing about the visuals of the Lisbon campaign. My thought on reading Richard Greene’s letter of May 21st was: why would Cóir hide its name in tiny letters on its very “imaginative and eye-catching” posters if it was not to separate the message from the messenger? He notes a curious feature of many of the posters currently up for the Lisbon both on pro and anti side. But I was surprised, on travelling around my area, to see that many politicians are doing exactly the opposite with large images of Mary Lou McDonald (No), Eoin Ryan (Yes), Lucinda Creighton (Yes), Gay Mitchell (Yes) and Paddy McCartan (Yes) plastered on lampposts. Is this relating the message to the messenger or just self-promotion in advance of next year’s European and local elections? Meanwhile, hark, is that splashing the sound of a ship being abandoned, or at least some nervous crew members sizing up the iceberg seemingly embedded in the prow, doing the math, and coming to their own conclusions (rightly or wrongly)? TAOISEACH BRIAN Cowen’s behaviour towards Fine Gael is causing “unprecedented” difficulties for the party in keeping its supporters campaigning for a Yes vote, the party has declared. Mr Cowen said yesterday he was “sorry” if some had taken offence at remarks he made in Portlaoise on Sunday, but he insisted he had not questioned the contribution being made by Fine Gael to the Lisbon campaign when he responded to questions about a Sunday newspaper poll. Fine Gael yesterday said that it had faced “a deluge” of calls from party councillors, party members and supporters to the party’s headquarters, its Leinster House press office and the party leader Enda Kenny’s office. “We have not seen anything similar. It is a hard sell as it is to separate Lisbon from everything that happened last week, and Mr Cowen’s Dáil outburst [ when he said he could silence Mr Kenny if the latter did not control his backbenchers],” said a party spokesman. This doesn’t mean that they’re not good Europeans. “There is no margin in it for Fine Gael. We are supporting the treaty because it is the right thing to do. The stuff at the weekend was the final straw. It certainly doesn’t help to motivate anyone,” the spokesman continued. Labour is undergoing a “tragedy” which has left Gordon Brown in a “vulnerable position” after a series of mistakes and bad luck. In the clearest sign of the unease among Blair’s supporters, who have kept a low profile since Labour’s defeat in the Crewe and Nantwich byelection, Phil Collins accuses Brown’s circle of placing their faith in the “deep poisoned well” of the leftwing Fabian tradition. This would presumably be the liberal ‘treasure’ that has the er… Liberal… Democrats at 22 in the polls. And the Conservatives riding high at 41 while Labour is at a pretty awful 27. He goes on, for it’s not just liberalism. He takes a swipe at Brown and his allies who place their faith in the “benign” power of the central state. “Ed Balls [the schools secretary] wants a national play strategy. Such gestures remind us that Labour’s faith in central government draws from the deep, poisoned well of its Fabian tradition. Now, one doesn’t have to be in thrall to statism to see that this reading of history is near nonsensical. Central government actually is a strong enabler of social justice, at least when moderated by a degree of sense. And in the United Kingdom the social progress made to date has largely been pushed by central government, across areas from the NHS to the liberalisation (that word again, but in a subtly different context) of British society through legislation. Who or what else has the societal heft to get these things done? Collins indicates that Blairites are becoming increasingly impressed by David Cameron, who attacks Labour for providing centralising “top down” solutions and who pledges instead to empower people. In his article, jointly written with the author Richard Reeves, Collins warns that Cameron and Nick Clegg, the Liberal Democrat leader, “have got the point”, unlike Brown who finds himself on the wrong side of a new divide in British politics. It’s hard not to sense a total fatuity in such a viewpoint. It doesn’t seem to strike Collins that the efficacy of the ‘solutions’ or more accurately the process aren’t the only factor in this, that the actual policies they expedite are of significance too. So, to give an example, while a certain localised empowered approach to schooling might on one reading be ‘progressive’ the actuality of it might, say, be sectarian or creationist. Hardly the sort of outcome I’d want in my political activity, and puzzling that Collins can’t seem to see this. So, once more it’s about a ‘soft’ approach where the content is secondary to the approach. Does it matter if your solution is left or right? It does not. Just as long as it is brought about in a ‘liberal’ fashion. Brilliant. And with this sort of disconnect from not merely a rhetorical allegiance to the left, but also from the actuality of it as expressed through the exercise of even minimal state power – because the state apparently is ‘limited’ in some unclear fashion, is it any wonder that Labour heartlands whose (and I mean this in no sense to be patronising) concern with ‘liberal’ or ‘authoritarian’ might be of considerably less significance than simply getting by, are turning to parties who however much we know will result in negative outcomes at least have the good grace to recognise how to articulate their interests. It continues in a manner where detachment from reality is near sublime. Collins says a more radical approach – far more than anything being offered by Cameron – should be applied to the NHS. Patients should be handed control of their budgets which, in the case of asthma patients, could mean them spending public money on double glazing. He writes: “The NHS can only survive through the use of liberal principles. The range of medical treatment is too large, the population too old and their expectations too great for the NHS simply to carry on as it is. This is risible. It shouldn’t be an either/or, if Collins had a whit of leftist thinking remaining he’d recognise that it should be both. Both proper medical treatments and supports. But in the headlong rush to provide a specious ‘autonomy’ to people some element of ‘choice’ however cosmetic, has to enter the equation. No mention either of the thoughts of medical staff who might find such an approach difficult to sustain in an individual case. And no thought that most who have brushes with medical procedures are less concerned by ‘choice’ than by the quality of the conditions, the expertise of the staff, the availability of a full range of treatments. Not to mention that the most useful allocation of resources on a national scale might well require something where ‘choice’ was low on the list in any event. But then perhaps Collins thinks that the business of Labour, or indeed politics in general, should the providing of a poor facsimile of the supposed ‘choices’ of that come with wealth. They, the Blairites, really really don’t get it. They refuse to accept any responsibility and refuse to understand. No hint that their incessant concentration on ‘reform’, or the Iraq War or supposed ‘modernisations’ which ripped the heart out of their own constituencies troubles them. For them it’s always 1994, chasing after the ‘new’ and ‘choice’ and a fickle middle class at the expense of building genuine support bases that would sustain the LP through the good and bad times… The problem is that there has been no ‘retreat into the heartland’… their project was a forced march away from it, almost deliberately ignoring it or, as the mood took them baiting it, for marginal political gain. Now perhaps there is an element of political calculation here – some jockeying to force Brown along another path, but maybe not. Maybe this is the real deal, the actual face of the New Labour project. One almost entirely detached from a real sense of ideology. Good riddance, guys. And briefly it was also heartening for all us old Babylon 5 fans to see that J. Michael Straczynski was the writer of the historical thriller Changeling which garnered many plaudits at Cannes. He’s a figure of some significance these days, but then he cut his teeth on Murder She Caused… I mean, of course… Murder She Wrote (like, did no one notice just how high the homicide rate went up every time Jessica Fletcher came to town?). Changeling stars Angelina Jolie and John Malkovich and was directed by Clint Eastwood. Reading the information in the Irish Times yesterday about the campaign I’m struck by how sharp the comments of the Taoiseach and Minister for Finance are about Fine Gael. In a comment believed to be mainly aimed at Fine Gael, he said he wanted to see the same level of support for the treaty in other parties who have “the same vocation to the European idea as we have”. Mr Cowen was speaking after newly-released poll results yesterday showed Fine Gael voters evenly divided between the Yes and No side, while an absolute majority of Fianna Fáil voters were supporting the treaty. Now the poll results are interesting, not least because they point to the undecideds breaking to the No side in greater numbers than to the Yes side. A poll on the treaty in the Sunday Business Post yesterday showed the Yes vote at 41 per cent, up three points, the No vote at 33, up five, and the don’t knows down eight points at 26 per cent. Cowen, et al, must be desperately hoping that such figures don’t translate into a loss in two weeks. That said, my rudimentary grasp of maths seems to indicate that the Yes side would still just shade it on the day. But interesting is it not the division within Fine Gael between Yes and No. How very unusual for a party that has hitherto seen itself not merely as a bastion of europhilia, but indeed the bastion of same. And the possible answer? Why step forward Deputy Leo Varadkar, never far from the thoughts of the CLR when they turn to Fine Gael. For in his response we see perhaps something of the dynamic which would lead to such a split. …enterprise, trade and employment spokesman Leo Varadkar accused Fianna Fáil of having prepared a “cowardly” strategy of blaming the main Opposition party in the event of a referendum defeat. “It is very obvious that in the event of a referendum defeat, Fianna Fáil’s cowardly PR strategy will be to blame Fine Gael. They are putting out this ‘spin’ for a few weeks now. Well, that’s fine, and there must be more than one person, myself included, who had precisely the same thought when I read Cowen’s comments. Whether cowardly, or astute, no doubt the electorate will judge. It certainly plays well in terms of maintaining party unity. But it is his next comment which is in a sense the giveaway. Hmmm… a spin on the spin – to protect Fine Gael should the event lead to wailing and gnashing of teeth in the wake of a referendum lost? Or the mask slipping just a little to reveal the entirely genuine visceral loathing of nuFine Gael for Fianna Fáil and the sense that this is as good a time as any to give them a lash. Because there is something just a little risible about discussing the conceit and arrogance of Cowen – whatever the truth of the matter – when he has been in power hardly a wet weekend. Nor, and this is crucial, is there any effort to call back those supporters voting No… odd, one might think. Or perhaps not. Another thought strikes. Is Libertas providing some cover for right of centre voters who either are fed up with Europe, antagonistic to its interventionist ways or once more willing to get the boot into the government? The Progressive Democrats may have gone, but their demographic remains, and may not be entirely comfortable with no place to go but Fianna Fáil. And does the example of Nice 1 and 2 give them some grounds for – well, perhaps not optimism, but the sense that they’ll be given the opportunity to be sure to be sure. And what of the prodigal sons and daughters of the left? No, not Labour, who Cowen was distinctly soft on in his comments, but rather the Green Party. His experience at EU level showed that “it is the only progressive forum in which the issues of energy security and climate change are being tackled”. “A key reason for my decision to support the Lisbon Treaty is that it takes important steps towards remedying [being a top-down organisation]. These include more direct lawmaking powers for the European Parliament and more supervisory powers for the Dáil and other national parliaments,” he said. Still, this is hardly a surprise. We’ve seen another generation of politicians on the left move towards such positions from a stance of total antipathy – and a big hi to the usual suspects… Indeed many moons ago I worked on research for DL on aspects of the EU (or was it the EC? So many acronyms, so little time), where I amongst others was charged with ferreting out the most noxious aspects of a certain area of European policy in order to bolster the anti side. As it happened I had to report back that all things considered – and to my genuine surprise – there wasn’t much that would be of actual concern. Ireland was sufficiently protected from opt-outs and suchlike that it had no tangible effect upon us (of course that this was true of that specific material provides no guarantee that subsequent material would be the same). The news was received, shall we say, with a certain lack of enthusiasm. And curiously policy statements on same didn’t alter until later when suddenly all things EC (or was EU?) were suddenly okay. Granted, that might have been a different party by then, and I was long gone from it, but that sort of thing stays with a young(ish) lad – as I was then – and makes him a tad cynical about the centrality of the issue to political discourse, and let me hasten to add on every side of the equation. Now I could comfort myself with the thought that that crop of politicians were uniquely susceptible to the flesh-pots of Brussels, but somehow I don’t think so. And while I’m not quite implying that it was chosen for political USP by all concerned on left right and centre, I would suggest that the passions it inflames are transitory even amongst the staunchest defenders and greatest critics. After all, even that other great supranational entity the United Nations is hardly beloved of the world. Simply put it’s hard to have any great affection for large political projects. They’re kind of dull, and having waded through more than my share of European legislation, draft legislation, documents and such like for a fair chunk of the 1990s it’s no surprise to see how easy it is to project onto them more or less whatever hopes or fears one might wish to. So the supposedly ardent Europhiles of FG can wobble more than a little when push comes to shove, while the supposedly agnostic FF, or even as we saw from the noises emanating from the purportedly critical SF during the last election (and got to love the charge by an FF TD about them being the most anti-EU party of the last forty years. Hmmm… I was a member of two supposedly more convinced anti-EU parties across a decade and I wonder how many of their members feel that same antagonism – precious few it seems), can offer the odd kind word, or put their shoulders to the wheel when necessary. Indeed I’m willing to place good money on another generation or two of Irish politicians following suit. Two weeks to go? Ten years might give us a better idea on how all this will play out.